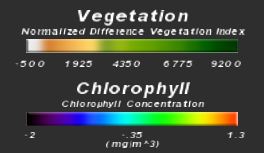 The Earth's seas and land both are biologically active: plants and animals are active in both sea and land, and in the ocean and land alike, the basis of all food lies in small plants and animals which use sunlight to drive basic chemistry to makes life possible through the action of chlorophyll. Satellites can see the absorption of sunlight by chlorophyll (in the leaves of plants on land, in the action of tiny organisms called phytoplankton in the sea) and map out the extent of biological activity over the entire earth. Just as certain areas on land are lush and others relatively barrens, the same pattern of very active and relatively barren areas can be seen in the Earth's ocean.